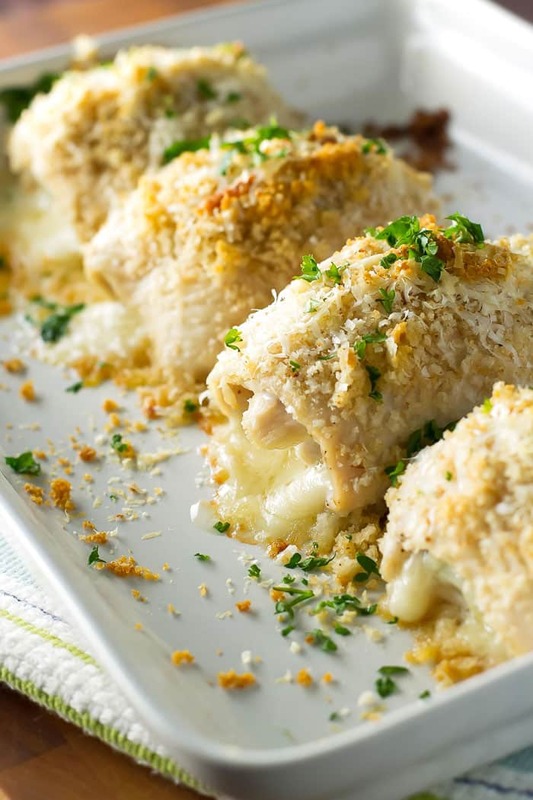 Easy chicken cordon bleu roll-ups stuffed with ham and creamy gruyere cheese. Last month we boarded a plane and many, many, many hours later we landed in Munich, dumped our stuff at the hotel, and walked our tired and jet-lagged selves to the nearest restaurant. Not long after we had plates of simple and delicious Bavarian food in front of us and tall glasses of beer in our hands. There is nothing better than that first meal after a long day of travel – in this case, a plate of chicken cordon bleu. Ordering chicken cordon bleu has become a bit of tradition when we are in Munich and it always seems to follow some sort of intense travel situation. As I mentioned, this most recent time was after a long flight, but the first time followed a very long car ride – up and over the Alps – that left every last nerve in my body frayed. Seriously, four hours on narrow and winding mountain roads followed by a couple of hours on the autobahn (where there really aren’t speed limits) left me white-knuckled and absolutely starving. Nothing induces mind-altering hangriness more than nerve-wracking travel – at least for me, anyway. A plate of comforting chicken cordon bleu and a big ol’ German beer were a welcomed sight after that adventurous drive – it really took the edge off. Last week I wanted to recreate that plate of comforting goodness because, let’s face it, a day at work can induce that same sort of hangry feeling I experienced as a passenger dodging cars on foreign motorways. However, I wanted a version that wasn’t complicated – in Germany, the chicken is pounded out until it’s very thin and then ham and gruyere cheese is layered on top. The whole thing is then breaded and fried and I have no idea how they keep it from falling apart. I knew if I tried it the ham and cheese would turn into a big mess, it wouldn’t stay together and I would end up calling the pizza place to save dinner. So, I took a page from my own book and made chicken cordon bleu roll-ups. They’re easy to pull together and healthier because they’re baked in the oven instead of fried, but equally as delicious as the chicken cordon bleu I’ve had in Germany. I made a batch after work and was surprised how fast they came together – in the time it takes to preheat the oven you can assemble the roll-ups and then just pop them in the oven. Thirty-ish minutes later you’ve got delicious little chicken roll-ups filled with ham and melty gruyere cheese that oozes out when you cut into the roll. I like it when that happens. It’s quick and easy comfort food with no trip to Germany required. Although, if I could go back to Germany tomorrow I would, but I can’t so… you know what I mean. 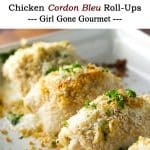 Buying thin sliced chicken breasts make these chicken cordon bleu roll-ups an easy weeknight dinner – in the time it takes to preheat the oven you can have them assembled and ready to go with minimal prep. They’re filled with ham and melty gruyere cheese and topped with crispy bread crumbs. In a small bowl, combine the bread crumbs, panko bread crumbs, parmesan cheese, salt, pepper, and olive oil. Once combined set it aside. Lay the chicken breasts flat on a cutting board. Place the ham on each and divided the cheese equally across each chicken breast. Roll the chicken breast up and place it, seam side down, on a baking sheet or baking dish. Top each rolled-up chicken breast with the breadcrumb mixture. Bake the chicken for 25-30 minutes at 350 degrees or until the chicken is cooked through (internal temperature should be at least 165 degrees). Remove from the oven and serve. I used chicken breasts that were already sliced thin for this recipe, which cuts out some prep time. If you are using regular chicken breasts, just slice each in half. You may need to use a mallet or rolling pin to pound out the chicken so it’s thin enough to easily roll-up. Depending on the thickness and size of the chicken you use, cooking time may be shorter or longer – always use a meat thermometer to check doneness! Ok, these look really good. That melted cheese, yes please. And great pics too! I made this dish toni8ght for dinner! Wonderful, and so easy! I love this! Oh my goodness, those scary car rides after a long travel are draining, aren’t they? Your story reminds me of a particularly scary taxi ride in Argentina after a 20 hour bus ride. Definitely made us hungry! 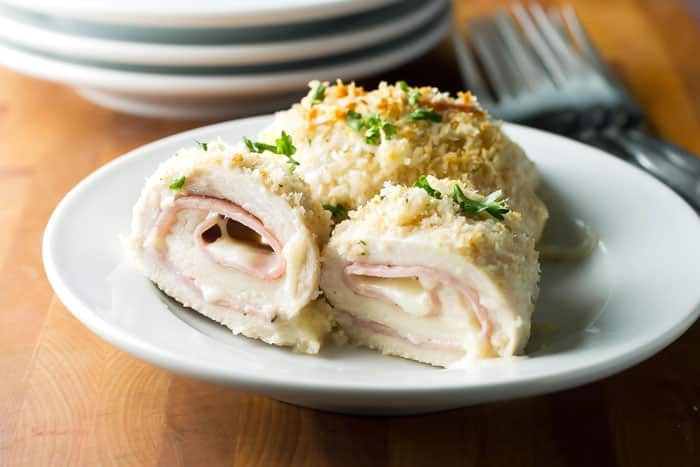 I haven’t had chicken cordon bleu in years, but this looks so delicious and comforting!